Some neutral nations managed to keep out of World War II, either by their own strength, their lack of strategic need to be conquered, or perceived lack of importance. Some of these successfully neutral countries that did not get drawn into the war included Switzerland, Sweden, Spain, and Ireland. Ireland was the only British Commonwealth country to refuse to align with the UK, while Spain, though owing a debt to Germany and Italy for the success of the Nationalist side in the Spanish Civil War, remained neutral despite urging by Germany to join the Axis. Sweden and Switzerland apparently had sufficient military strength to deter gratuitous attacks on their territory. Other nations that tried to remain neutral were drawn into the war anyway, by both the Axis and the Allied powers, including Iceland, Norway, Belgium, The Netherlands, Luxembourg, Monaco and Denmark. Lichtenstein managed to stay neutral by leaning on Switzerland for protection, and Andorra, while still technically at war with Germany since World War I, also managed to stay out of the fighting. Iran attempted to declare itself neutral but refused British demands to expel all Germans from the country, resulting in a British invasion and occupation of Iran. Iran then changed leaders and joined the Allies. Questions for Students (and others): Which of these countries allied with Germany and Japan were you unaware of being our enemy during World War II? What country surprises you the most? Please let us know in the comments section below this article. Germany/The Axis invaded Yugoslavia in 1941, setting about carving up the country into manageable sized chunks giving ethnic nationalities their own nominal homeland. Installing their own puppet type governments, Germany was able to compel the alliance of Yugoslavia with the Axis, although Josip Broz Tito and his communist partisans fought the German occupation more or less continuously until Germany and her allies were defeated in 1945. Although the Royalist faction of Yugoslavs also fought partisan warfare against the Germans, once the communists took over Royalists were rounded up and executed wholesale, cementing the control of Yugoslavia by the communists. Kingdom of Romania at the beginning of 1939. Map by TRAJAN 117. Like many European countries, Romania found itself between belligerents and in an awkward position of being beset on all sides. Right at the start of the war, Romania favored Poland by allowing Polish government officials safe passage, but suffered territorial losses to some of its neighbors, such as Hungary, Bulgaria and the Soviet Union. Fearing an invasion from the Soviet Union, Romania threw in their lot with Germany and the Axis in 1940, a move that seemed expedient at the time, a matter of survival for the country. Romanians fought alongside other Axis forces in the war against the USSR, but when overrun by the Soviets in 1944, a pro-Allied government was installed and Romania declared war against the Axis. The Kingdom of Hungary in 1942, during World War II. Map by TRAJAN 117. Hungary was an enthusiastic ally of Germany as of 1940, taking part in the invasion of the Soviet Union in 1941. The Hungarians remained allied with Germany until overrun by the Soviets in 1945. 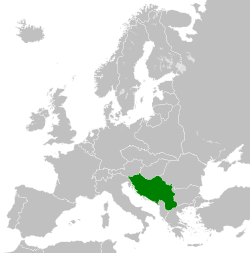 Hungary had used its ties with Germany and Italy to successfully claim some territory from some of her neighbors, such as Slovakia and Romania. In 1944, Hungary attempted to switch sides, sending out peace feelers to the US and UK. The Germans did not take kindly to this betrayal, and occupied Hungary until ousted by the Soviets. Kingdom of Bulgaria on the eve of World War I. Map by TRAJAN 117. Bulgaria both took the opportunity to gain territory by aligning with the Axis as well as protecting itself against preemptive occupation by the Axis forces by joining the Axis/Tripartite Pact in 1941. Bulgaria allowed German forces to transit their country to invade Greece, and Bulgaria took the occasion to grab some Greek and Yugoslav territory for itself. In 1944, with the fortunes of war turning against the Axis powers, Bulgaria experienced a coup by its communist contingent, realigning itself with the Allies and Soviets against Germany and the Axis. One smart move the Bulgarians had made, was to avoid taking part in the invasion of the USSR in 1941, thus avoiding Soviet ill will once the Soviets got the upper hand. 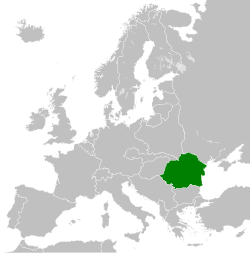 The Slovak Republic in Europe in 1942. Map by TRAJAN 117. When Germany bullied its way into Czechoslovakia in 1939 after the miserable 1938 “Appeasement” by British Prime Minister Neville Chamberlain, a Slovak Republic was formed as a pro-German spinoff of the parent country. Slovakia was bitter about territorial losses to Poland and Hungary and joined Germany in its attack on Poland as payback for those annexed Slovak lands. When the war went badly for Germany and its allies in 1944, there was an attempted uprising in Slovakia that was put down by the Germans. Slovakia was given back to Czechoslovakia by the Soviets in 1945. Independent State of Croatia in 1943. Map by TRAJAN 117. Location of Iraq. Map by User:Izzedine. Iraq admitted a small contingent of British military forces early in the war, but the perceived British precarious position soon after the war started led Iraq to back away from leaning toward Britain. A pro-Axis bloc took control of Iraq in 1941, welcoming German military support. Britain reacted by invading Iraq with troops from India. Iraqi attacks on British Commonwealth forces were defeated and the pro-Axis government of Iraq was forced to flee. The British coerced Iraq into declaring war on Germany in 1943, one of the many switches in sides during World War II. Thailand during World War II Orthographic map by Murashel. A sort of ally of Japan at the onset of World War II, Thailand used this alignment to seize some of French Indochina for itself when Japan invaded Indochina. In 1941, Japan found it necessary to invade Thailand and Thailand was forced to surrender to Japan. Finland’s concessions in the Winter War. Map by Jniemenmaa. The Soviets took advantage of their “Non-Aggression Pact” with Germany to try to grab some territory from Finland, aggression fiercely resisted by the overwhelmed Finns. After the Soviets won territorial concessions, the fighting resumed in 1941 when the Germans invaded the Soviet Union and the Finns saw an opportunity to get their territory back in the so called “Continuation War.” Thus, as a matter of expediency, the Finns found themselves aligned with Germany and Axis powers against the Soviets. Of course, the Soviets eventually won. The Soviet Union during the Cold War. Map by Ssolbergj. Stalin signed a “Non-Aggression Pact” with Germany in 1939, the writing was on the wall for a German invasion of Poland, with complicit Soviet approval. In fact, the Soviets used that invasion as a pre-agreed upon excuse to also invade Poland, splitting the hapless country between the 2 dictatorship led countries of Germany and the USSR. Stalin found out just exactly what the cost of making a “deal with the devil” was when Germany invaded the USSR in 1941, the largest invasion in human military history. The British and Americans were compelled by expediency to embrace the support of the Soviets in their war against Germany and the Axis. Coetzee, Frans. The World in Flames: A World War II Sourcebook. Oxford University Press, 2010. Mawdsley, Evan. World War II: A New History. Cambridge University Press, 2009. The featured image in this article, a Japanese Postcard published in 1938 – Portraits of Hitler, PM Konoe and Mussolini – Children waving German, Italian, and Japanese flags (Anti-Comintern Pact), is in the public domain in its country of origin and other countries and areas where the copyright term is the author’s life plus 70 years or less. Next Article When Was the Driving Test (Driver’s License Exam) Invented?